← Where are the Currents Weakest Around Manhattan? 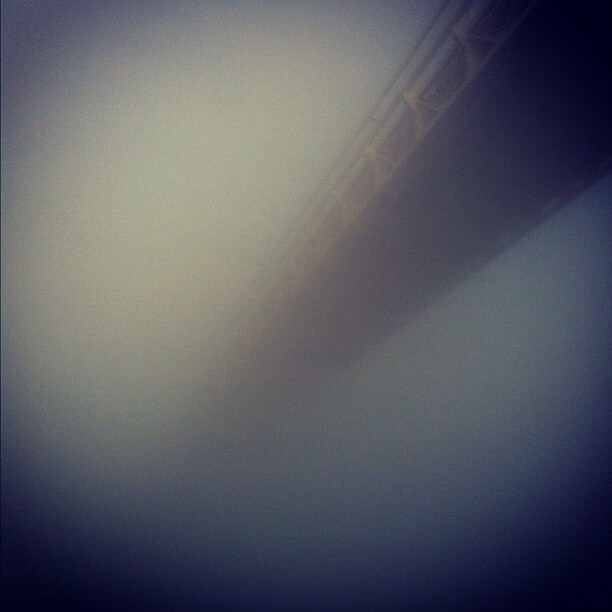 A rare but often beautiful sight around New York City is dense fog. It might have to do with my vantage point, from Hoboken or Manhattan, where we often look over it from the outside. It might not be so popular out in Brooklyn, which can get doused for days, or for people waiting through delays at airports. And not to forget all those people who have bad hair days (Credit: Jennifer). Maybe there’s a little bit of envy in my heart for San Francisco and other West Coast locales where silky layers can sometimes rise up from the sea and pry ownership of the heavens from skyscrapers, or share the sky with glorious red cabled bridges. 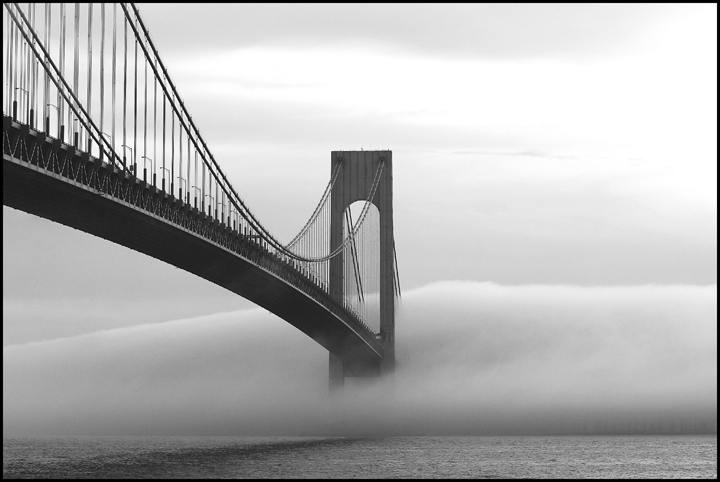 But nothing smoothes out our manic city’s rough edges like a soothing greyscale layer flowing in past Verrazano Bridge. Fog in our region comes in five different flavors, and a science paper recently cataloged them (PDF) and counted the events over twenty year’s time. Some blow in from the ocean during the day, riding on the sea breeze – these are called advective fog events (~30% of total). Some coalesce overnight amongst the buildings and shadows and huddle until the sun shoos them away – this type is called radiation fog due to the role of escaping heat, aka long-wave radiation, enabling condensation of humid air (10%). Another is called precipitation fog, which arrives during rain events (40%). And a common one in cooler seasons is cloud base fog, where fog sets in with clouds lowering down from above (20%). The fifth, and one we perhaps don’t see in urban areas at all, is morning evaporation fog (2%). A good example of advective fog came last April, and I blogged about how it blew in on the sea breeze and washed over Brooklyn and parts of Manhattan. The heart of the city, however, is somewhat protected by its urbanization and the heat island phenomenon, while more rural areas get the most frequent fog episodes. I’m not totally sure which type of fog we’ve had this week, but I think it’s mainly been advective fog. The night of March 19-20 brought probably the most spectacular fog, and it arrived at 3:30 AM at Kennedy Airport, with a south wind. But it arrived at 6:30 AM at La Guardia, with a northeast wind. Radiation fog technically only occurs with light winds, so this was probably advection fog. But they can also be a mix of these two types, where a marine air mass slowly moves in late in the day, and then the nighttime radiative cooling allows condensation. But it’s nice to not be sure, because fog is supposed to be mysterious. 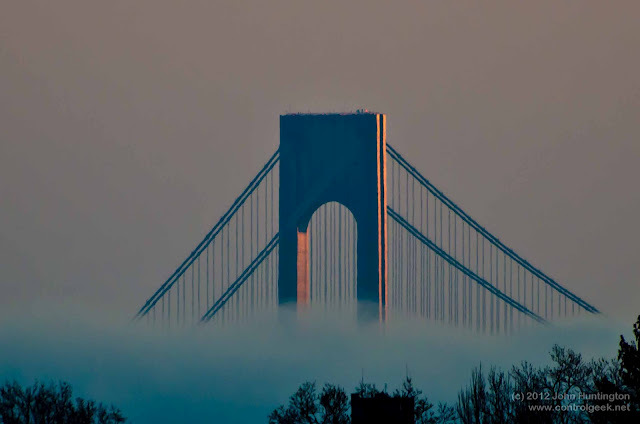 This entry was posted in photography, weather and tagged advection, bridge, Brooklyn, climatology, cloud base, fog, New York City, photo, Rasmussen, Tardif, typology, Verrazano. Bookmark the permalink.